I really am trying to avoid “rabbit holes” while I develop the new printmaking business. Sometimes it’s hard to tell the difference between a diversion and the development of a personal style. This next little project is right on the edge. The mountainous area where I live is rich in natural pigment minerals. We have a vein of deep red clay on the ridge where I hike all the time. There is so much pure clay that there was once a brick factory in the town on the other side of that ridge. 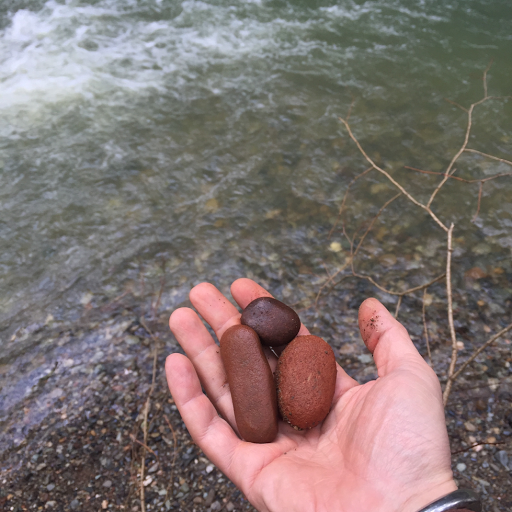 Five miles away is at least one vein of gold ochre that washes into the creek. Selling craftwork, in my experience, is all about selling the story behind it. When people see my new body of work, I want them to understand that my artwork is intimately tied to my lifestyle. With the weaving, I bridged that gap by showing folks pictures of my yurt-based studio as a way to understand my methods and my motivation for doing what I do. 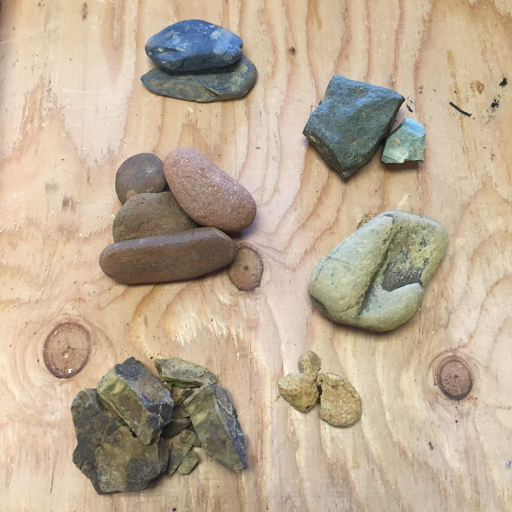 The new work will contain lots of imagery from the nature that I see every day, but I’d love to be able to take it up a notch and include minerals that I find on my hikes into the work itself. Eventually, I’d like to pay for hiking trips by visiting places with unusual pigment stones and adding them to my collection of art materials. The new story, in a nutshell, is that I have found a creative outlet that allows me to deepen my relationship to natural places, and to make a small part of my nature experience available for others to bring into their lives. That said, I also need to be mindful of the return on my investment of time to develop this portion of the art. I cannot let it become a diversion that prevents me from producing the work I need to get my business off the ground. If it starts to take up too much time, I’ll shelve it and use commercially available pigments until some future point when I can afford to invest time into using raw pigments. Such is life! It’s a balancing act between what I want to do and what I can afford to do.